Now that I've got a shiny new slightly used recognizable Eclipse in my driveway, its time to take a closer look around. I need to know what I've got on my hands before I start ordering parts. The car is a repo, so the original owner will not be any help here. 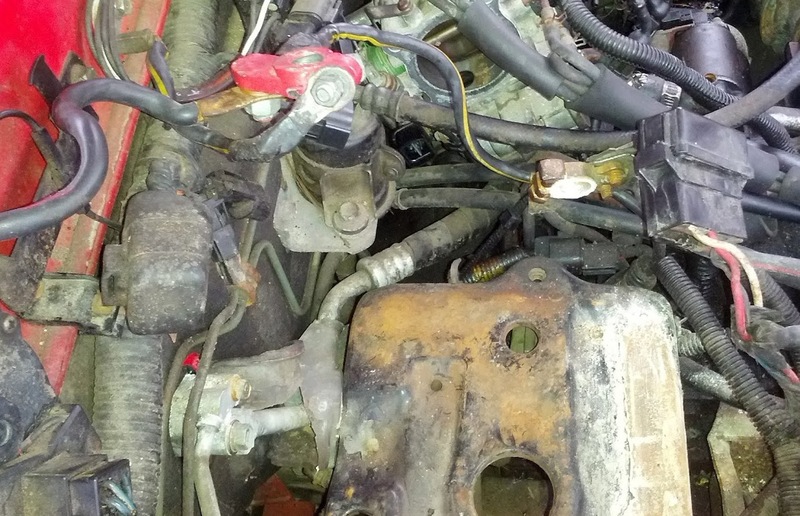 I know that there's a pile of spare parts in the trunk, maybe there will be some clues to the condition or history of the car...Click read more to find out! Its like the worst Lego set ever. I open the hatch, and it promptly dumps water on all my spare parts. 1 problem identified. The hatch weighs a ton and when I let go, it closes slams down with the force of a million bowling balls. 2nd problem identified. 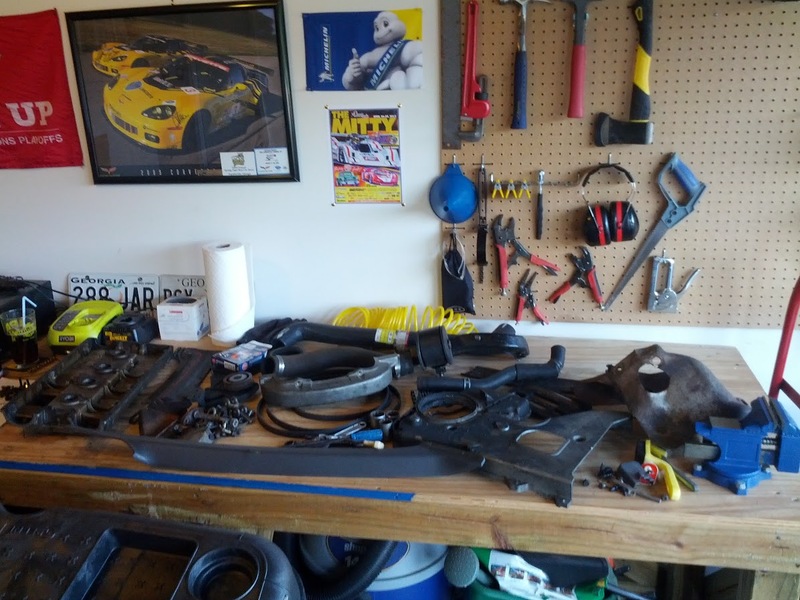 I grab a 2X4 and prop it open while I empty out the contents of the car and array them on my workbench. What I learned from this: This guy was drinking with his bronies down by the lake when his car was repo'd. Cool story, bro. Not really useful information, though. Timing just needs to be 'close enough,' right? Maybe the timing system would have something to tell me. You can see in the picture above that the marks are off by 1 tooth (marks are centered in the shot, on the gear teeth). 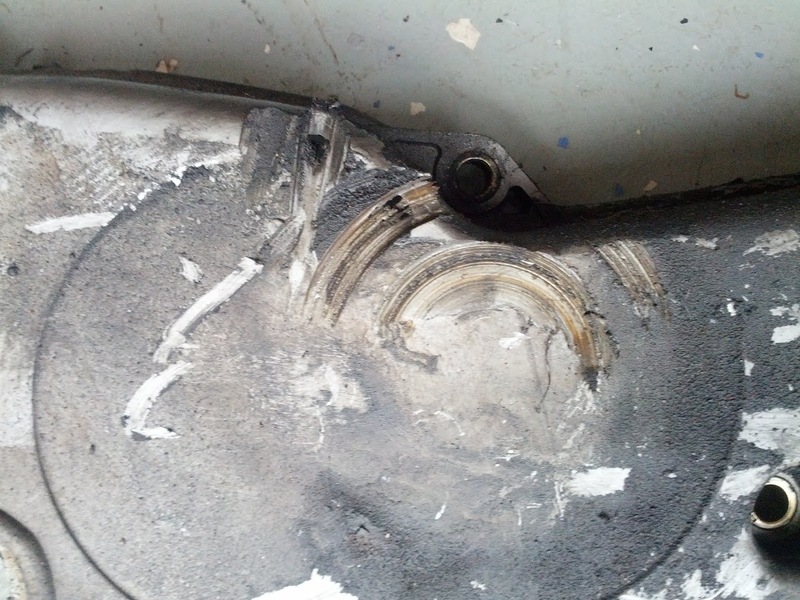 This confirms my suspicion that the compression numbers indicated a timing problem. Since this is an interference engine, I'll need to remove the head to check for valve and piston face damage. This is a close up of the timing cover. You can see damaged cause by pulleys while they were still spinning. 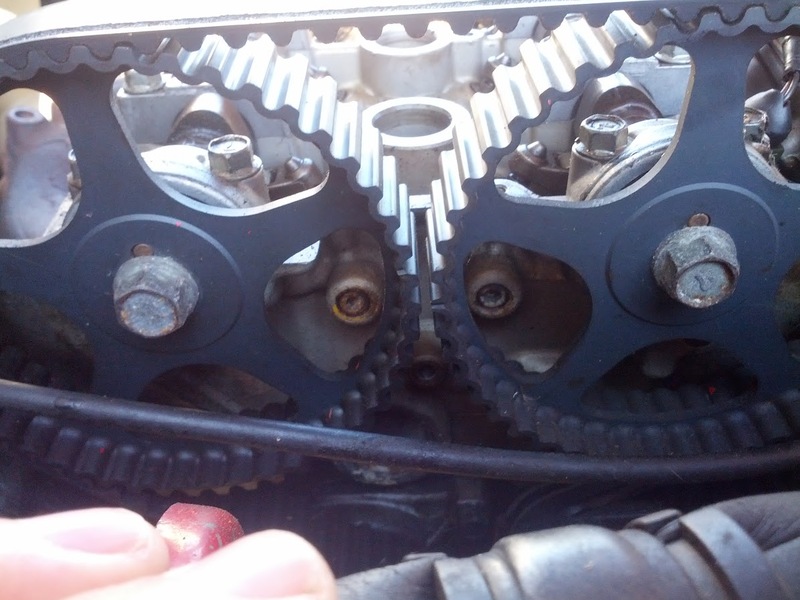 This suggests that the timing belt came off while the car was running, which means the valves are almost surely damaged. There're enough clues here to put together a story, but I want to perform my own compression test to confirm the seller's numbers. This part of the post is a PSA. Can you identify what is wrong in the picture above? Other than the disassembled throttle, missing battery, and corrosion? Take a minute and look...its a little tricky. A previous owner swapped the battery terminal clamps, so that positive is now black and negative is red (the give-away is the red terminal clamp being grounded). Not having noticed this, I used my truck to jump the Eclipse to crank the engine for the compression test. I used the terminal colors to identify them, and promptly connected the batteries positive to negative, creating a short circuit and sending sparks everywhere. ALWAYS wear safety glasses and take appropriate precautions for the components you are working around. The compression test yielded numbers different from the seller. Cylinders 1-3 were very low, but cylinder 4 read 125psi, which is within the recommended range. Maybe I'll get lucky and only need to replace valves on 3 cylinders. So if at this point you can only count on having the body and the engine block, I would not hold out for much of anything else. I've had a few small successes in between the discoveries of horrible misuse. I'll include them in the next post along with examining the head.